Unless you've been living under a rock, you'll know that Rihanna has launched a make-up range which has, as expected, been hugely popular with make-up lovers everywhere.With Fenty Beauty selling fast, her successful collaboration with sports brand Puma, as well as topping the charts with hit after hit; Rihanna is on top of the game as a musician, fashion icon and influencer. One of Fenty Beauty's biggest selling points is the diversity of the range; the Soft Matte Longwear Foundation boasts an impressive 40 shades which Rihanna herself says will suit every skin tone, from extremely pale to the most beautiful black. The shade range has proved revolutionary on both ends of the spectrum; it's known that people of colour are not properly catered for in the beauty industry, and likewise with the paler community, including those with albinism. The diversity of Fenty Beauty outshone many other leading beauty brands who don't provide enough shades for POC in their face products, and many responded through marketing in a bid to compete with Rihanna's success. The most talked about response was a rather direct one from Make Up For Ever, captioning their Instagram post "40 shades is nothing new to us..." followed by a rather sassy use of the Lips emoji. The best part about this post is Rihanna's comment in response with a short, straight to the point "lol. still ashy". This then caused a bit of a debate in the comments as to whether Rih's response was petty, childish or downright hilarious. From where I stand, the singer was simply responding to a brand clearly attempting to put-down her efforts and success in a jealous, petty attack. A marketing response could've been done with more subtlety, grace and professionalism like the ones to follow. 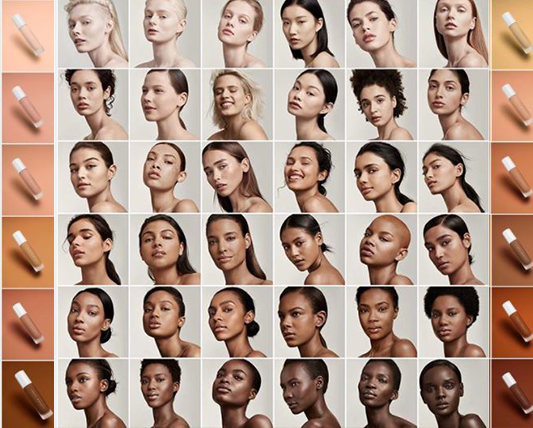 Of course, this could just be a coincidence, but the large amount of POC models in a block of posts sticks out pretty far compared to the rest of the feed (which normally includes POC models every once in a while amongst other beauty images of white models and make-up products). While most attempts to gain exposure around the time of Fenty's launch didn't appear as malicious and sassy as Make Up For Ever's, it's clear they didn't go unnoticed and some Fenty-loving Twitter users weren't having any of it, one user dubbing the efforts as 'pathetic' - which made me and clearly 46,000 other users laugh. In the game of digital marketing, these responses were, of course, expected when Fenty's competitors realised they need to step up their diversity-game and ultimately catch up with the successful new-kid-on-the-block, Rihanna.